How Big A Threat Is Saint Mary&#39;s To Beat Villanova? How Big A Threat Is Saint Mary's? Ignore the seedings. According to the analytics, one of the most evenly matched games of the NCAA Tournament’s first round isn’t an 8-9 or 7-10 match-up, but the battle between Villanova, the sixth seed in the South Region, and 11th-seeded Saint Mary’s. Kenpom, which rates Villanova as 26th in the country and Saint Mary’s as 31st, gives the Wildcats only a 52 percent chance of winning. Another analytic site, Torvik, has it even closer—they have Nova and Mary’s at 35th and 36th in the country, respectively. 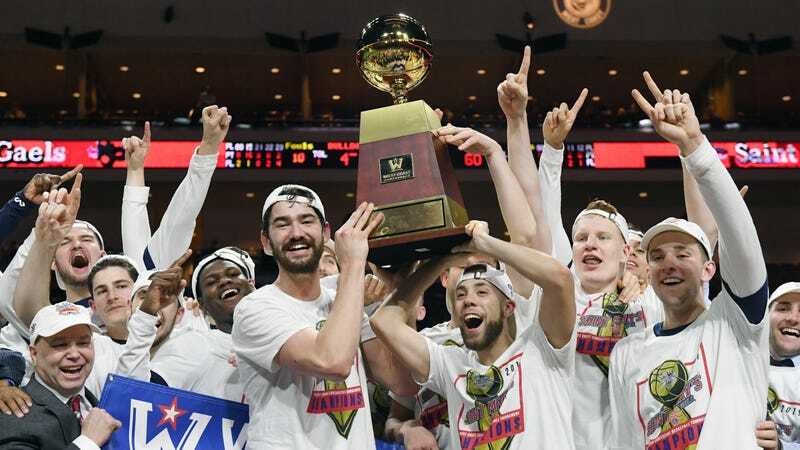 The Wildcats might well be overrated by the committee; two national championships in three years will tend to skew perspective a bit. But after beating Gonzaga 60-47 in the final of the WCC tourney to make it to the field of 68, the Gaels have shown that they could be a potential landmine for any prominent program unlucky enough to wind up opposite them. If you’ve been following college basketball during this century, you’ll know Saint Mary’s as a very odd, notably pale little program that routinely punches above its weight. For a small school in Moraga, California, their rosters skew notably global; longtime head coach Randy Bennett recruits liberally from Europe and Oceania, with impressive success. Only five of the players on this year’s roster are from the United States, and the stars the school has produced in the past decade—from Patty Mills to Matthew Dellavadova to Jock Landale most recently—all come from down under. Saint Mary’s style has also been consistently unconventional in recent years—sort of a knock-off version of the one that Tony Bennett (no relation to Randy) runs at Virginia. The Gaels play at the third-slowest tempo of any team in the tourney, behind just Liberty and the Cavaliers; their average offensive possession is 20.2 seconds, which is longer than any team but Virginia. At its least energetic, Saint Mary’s offense offers all the aesthetic thrill of an old man strolling lazily through an empty park on a Sunday morning. There is rarely even a hint of urgency to it, as each player works individually to create his own shot in respectful parallel. Saint Mary’s assists on only 37.9 percent of their field goals, the least in all of college basketball. Does this sound fun? It may not sound fun. But when the Gaels execute, their style can be very effective, and is off-putting enough to give them a shot against far more talented teams. In the WCC title game, Saint Mary’s put the clamps on and held Gonzaga to just 60 possessions, their fewest in any game this year. Thanks to that limited number of shots and their inability to make a lot of the shots they did get, the Bulldogs only scored eight points in the game’s final 10 minutes, and 47 points total—by far their worst offensive performance of the year. If this style works against Gonzaga, it could work against anyone. The torture of the Gaels at full Gael is not the only reason why analytics is significantly kinder to Saint Mary’s than the selection committee. The secret, there, is Saint Mary’s ability to score so efficiently after bleeding the shot clock dry. They take great care of the ball, which keeps opponents out of transition, and three of Saint Mary’s starters are shooting over 40 percent from three on the season. Center Jordan Hunter and power forward Malik Fitts are also crucial as rebounders, which allows the team to extend possessions on offense and end them on defense if the initial attempt doesn’t fall. Saint Mary’s doesn’t have a player as dominant as Jock Landale was last season, and their offense has slipped a bit as a result, but they’ve more than made up for the disparity by showing more intensity without the ball, giving up .969 adj. points per possession this year after allowing 1.032 last season, according to Kenpom. The Gaels’ distinctive style is not some magic charm that saps the powers of whatever higher seed they might encounter. They’re 2-6 against tournament teams this season—though they’ve improved a lot since getting fly-swatted by Gonzaga in early February—and will be dramatically out-gunned against Villanova in terms of talent. But their style of play can be a great equalizer, and Villanova—and any other team that plays Saint Mary’s—will have to come out shooting hot, limit empty possessions as much as possible, and pray that they don’t fall behind by too much. Stumble into a hole against the Gaels, and it swiftly becomes almost impossible to climb out.